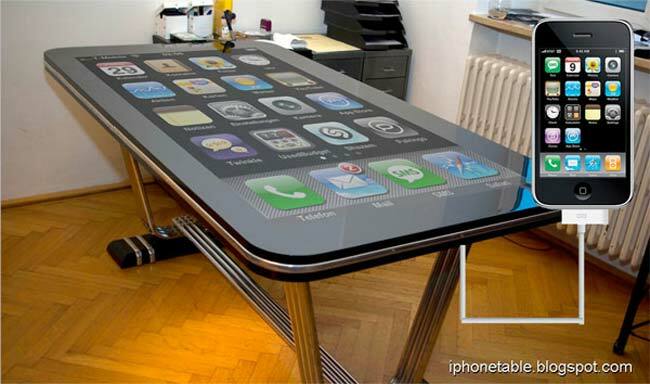 We have featured a few cool designs based on the Apple iPhone here at Geeky Gadgets, including some coffee tables and even desks, now we have the Table Connect, and the difference between this and the other we have seen is that it actually works. The Table Connect can be hooked up to your iPhone, and you end up with a 58 inch working iPhone desk, and you can use the desk just like your iPhone to launch apps and browse the web. The guys over at Table Connect are going to release a video of this awesome iPhone desk in action on Tuesday, so check back then for more details.